Woods Hole, MA- What if we explored the ocean's vast twilight zone, teeming with undiscovered life? Today, the Woods Hole Oceanographic Institution (WHOI) was awarded $35 million–the largest philanthropic gift in the Institution's history–to do just that. The award comes from The Audacious Project, a bold new philanthropic collaboration housed at TED to fund critical ideas that have potential to create massive, global change. The $35 million award to WHOI will catalyze a multi-faceted, multi-year effort to explore and understand one of the planet's hidden frontiers: the ocean's twilight zone, which extends around the world from about 200 to 1,000 meters below the surface of the ocean. 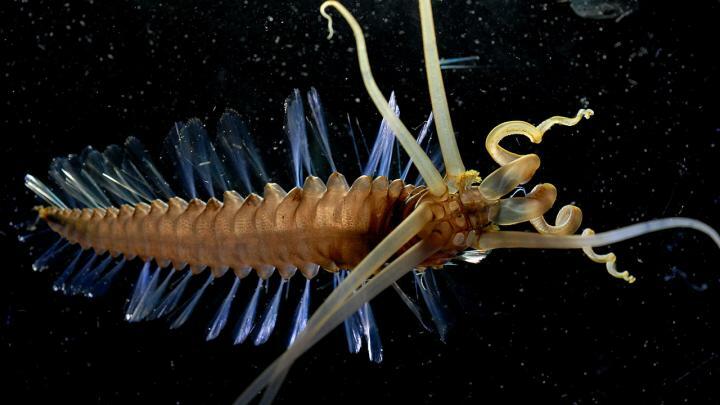 Also known as the mesopelagic or the mid-water region of the ocean, this vast and largely unexplored realm below the sunlit surface waters is teeming with marine life, which may include more fish biomass than in the rest of the world's ocean. Tiny particles swirl down through the darkness like snow, and flashes of bioluminescence give it an otherworldly feel. Life in the twilight zone is also intertwined with Earth's climate, helping to control the rate at which the ocean absorbs atmospheric carbon dioxide and transfers it to the deep ocean, where it can remain for hundreds or even thousands of years. "Despite its importance, there are still many things we don't know about the twilight zone," says WHOI biologist Heidi Sosik, one of the project's lead investigators and a speaker at TED2018. "I think there's an almost unlimited opportunity for breathtaking new discoveries." "WHOI is uniquely qualified to take on this challenge because of our heritage of bringing together diverse teams–scientists, engineers, and technicians– to develop the innovative technology needed to explore this unknown frontier of our Earth, and understand its potential benefits for humankind," says Mark Abbott, president and director of WHOI. Using next-generation robotic vehicles and sensors, WHOI will study what and how much lives in the twilight zone; how organisms there interact with each other, their surroundings, and with surface waters; how to design new tools to explore the region; and how the twilight zone helps regulate Earth's climate. "We need to get those answers quickly because the twilight zone is under threat," Sosik says. The zone is largely outside the reach of fishing regulations, and commercial fishing interests are already scaling up efforts to harvest the region, despite a fundamental lack of knowledge about the extent of the resource or how unbridled extraction might affect the ecosystem or global climate. "We can't turn back the clock on decades of overfishing in regions of the ocean that once seemed inexhaustible," Sosik says. "But we can take a different path this time. Smart policies arise from sound data." "This is not just a journey for researchers here at WHOI," Abbott adds. "It's for the entire global community. The collective decisions we make now will impact what the ocean looks like for centuries to come." Abbott notes that the twilight project's funding and focus also build on the long-term investments in WHOI technology and science by federal agencies, including the National Science Foundation, the Office of Naval Research, the National Oceanic and Atmospheric Administration, and the National Aeronautics and Space Administration. The 2018 Audacious Projects are: The Bail Project, Environmental Defense Fund, GirlTrek, Sightsavers, and Woods Hole Oceanographic Instituion. The inaugural cohort also includes Living Goods & Last Mile Health and One Acre Fund, which were piloted during beta-testing of the philanthropic model. The Audacious Project coalition of leading organizations and individuals–among them the Skoll Foundation, Virgin Unite, Dalio Foundation, The Bridgespan Group and others–has collectively raised over $250 million to help fund the first round of big ideas. This commitment has catalyzed additional funding from the projects' networks. To date, The Audacious Project has over $400 million committed towards its $634 million goal. People around the world are invited to learn about and support each initiative financially –and in other ways–alongside participating members of the coalition. Each idea includes a specific budget that matches its ambition with viable, sustainable timelines that span years. "Having spent a decade mobilizing globally impactful projects with the TED Prize, we now have a coalition ready to support some of the world's most heroic and devoted social entrepreneurs as they're asked to dream and collaborate at the most transformative scale possible," said Anna Verghese, Director of The Audacious Project. "The 2018 recipients are forcefully leading the charge in tackling global warming, social injustices, disease and health care. Collectively confronting these daunting challenges is what The Audacious Project is all about and our team is here to support this critical work." To learn more about the WHOI's effort to explore the ocean twilight zone, visit twilightzone.whoi.edu; to learn more about other projects being funded through Audacious, please visit AudaciousProject.org.